Hey friends! 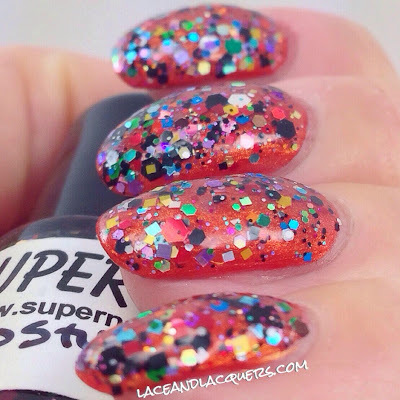 Today I have 4 more polishes from Super Nails. If you missed the first 4 polishes I reviewed - be sure to check them out HERE! Sorry the post is late, but I think you'll enjoy these. 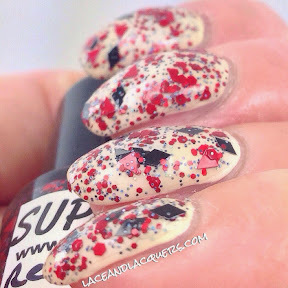 Check out swatch and review of them after the jump! Red Hot Devil is a "clear Polish Base with Red triangles, and Black Diamonds, surrounded by holographic black glitters, and matte red hexes of all sizes". 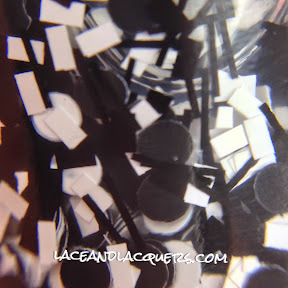 The black holo glitter is freakin' awesome. I need more black holo glitter in my life. 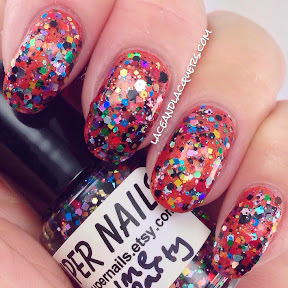 This is a fun mix of glitter! It would be cute with a devil costume for Halloween. 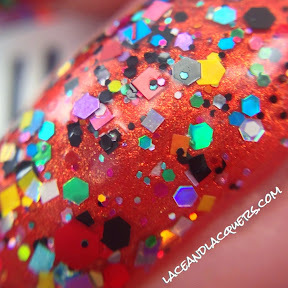 I did 2 coats of Red Hot Devil over Zoya Jacqueline. 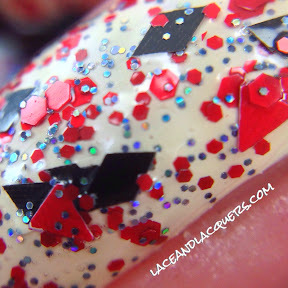 No issues with application, all the glitter came out nicely - even the triangles and diamonds. No fishing required. Dry time was great. Jack Skellington is a "clear polish base with white dots, black dots and large circles, black rectangles, white rectangles, and black bars for his lanky arms and legs". 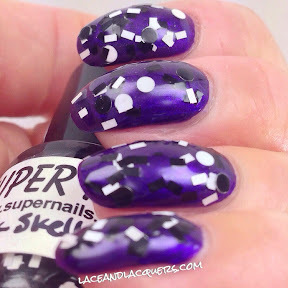 I really liked the rectangles, I've never seen these glitters before. 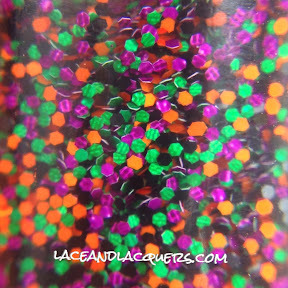 This polish is super fun and would look awesome over any color. I did 2 coats of Jack Skellington over Zoya Belinda. Application was smooth. It was a little base-y at first but was nice after I mixed it up a little, really helped grab the glitters. No issues with dry time either. Costume Party is a "clear polish base with black and rainbow glitter hexes and squares of all sizes and textures! 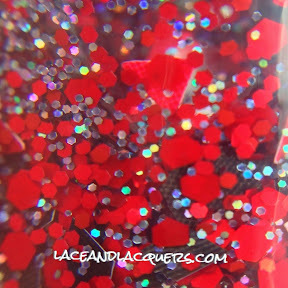 Includes holographic glitters, matte and metallic glitters in all colors". There's ton of colors in this polish, almost made it hard for me to layer - but I found a polish LOL. Nice multicolored glitter topper with a nice mix of finishes. 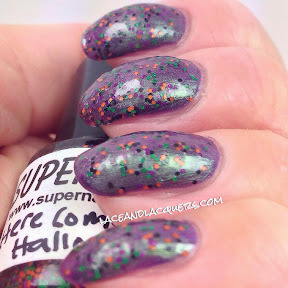 I did 2 coats of Costume Party over Square Hue Crown Street/Drive (I had 2 bottles with different names!!!). There were no issues upon application. Glitter covered nicely in 1 coat. No problems with dry time to report. 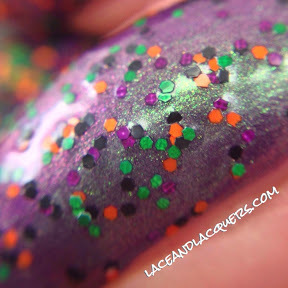 Here Comes Halloween is a "clear polish base with a mix of tiny matte orange, purple, black and dark green glitters". 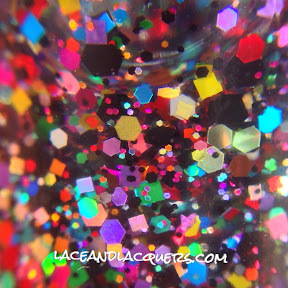 This can be worn alone or over a polish. I did 1 coat, so I can see this covering nicely in 3 coats. 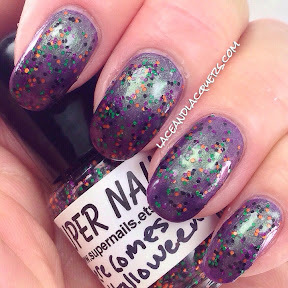 A nice matte glitter top coat in festive Halloween colors! 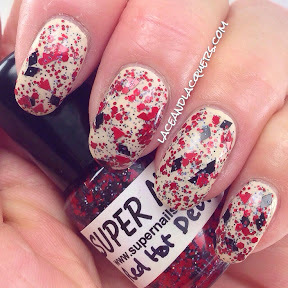 I did 1 coat of Here Comes Halloween over Color Club Port-Folio. Glitter coverage in 1 coat was great. Smooth and easy to work with application. No problems with dry time! Again, if you missed the first 4, be sure to check them out - HERE! Hope ya'll have a nice evening! 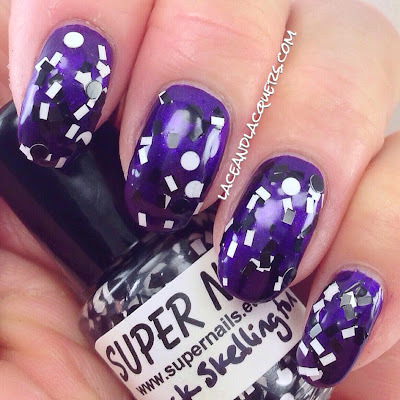 I'm not generally a fan of glitter toppers, but Here Comes Halloween looks fun, and like it'd go great over a variety of colors.